If you are stuck somewhere and need a healthy energy boost, bars can be a terrific option. However, they can also be costly and often include a ton of not only hard to pronounce ingredients but often gluten and whey ingredients as well. 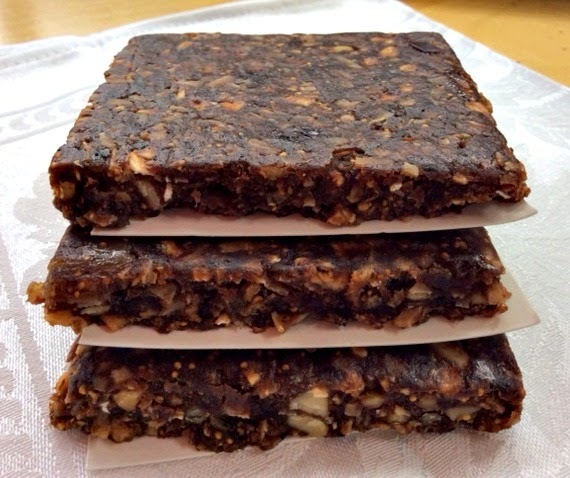 After experimenting with and tasting many gluten and dairy free energy bars out there, I realized I could make them at home, saving money, and resting easy knowing where they came from.These GF/DF/Grain and Soy Free Fruit and Nut Bars will not weigh you down, and they will give you the energy you need to tackle your busy day. Heat the oven to 325 degrees. Coat a 13 x 9 baking pan with the melted coconut oil and then line with parchment paper leaving a few inches hanging over the sides of the pan for easy lifting later. Set aside. Stir together flour, cocoa powder and orange zest in a large bowl until evenly mixed. Add almonds, raisins, dates, coconut, bananas and figs and stir to coat. Pour the honey into a small saucepan and place over low heat. Increase heat to medium and cook, without stirring, until mixture reaches 245 degrees on a candy thermometer, about 6 minutes. Immediately pour over the fruit and nut mixture and working quickly, stir until dry ingredients are coated. Transfer to the prepared pan and, with moistened hands, press evenly into the pan. Bake until mixture has puffed slightly about 35 minutes.The mixture will be soft and sticky to the touch. Transfer to a rack to cool to room temperature, at least 2 hours. Remove from the pan (by lifting the parchment paper that was hanging over the sides). Cut into about 24 squares. They look so yummy! Do have the basic stats per serving? Unfortunately I do not have the stats per serving. I guess in the future I could try to enter the ingredients in a nutrition computer program and try to come up with that info. Need to research that further. Thanks for visiting! This does look yummy. Is it 1/2 cup of pitted dates or 1/2 pound? It just says 1/2 pitted dates chopped! Sorry for the typo. Meant to say 1/2 cup of pitted dates, chopped. Thanks for catching that and thanks for visiting my blog! Please link back to my specific GFW post for this week, so folks can find all the other goodness shared this week. ;-) Have a great week! All linked up! Thanks Shirley! These look fantastic! I make dried fruit and nut bars, but I like that this seems a bit heftier with the coconut oil. Thanks Debra and yes these are a little healthier than most. Thanks for stopping by!